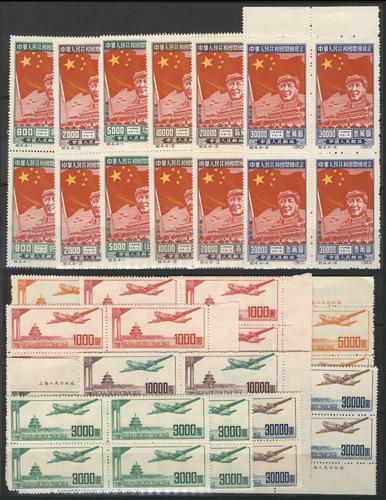 1940s-50s five stamps in full sheets, comprising East China Mao $150 in sheets of 200, R4 $500, $3000 & $5000 in sheets of 200 and C19 (4-3) in sheet of 104. 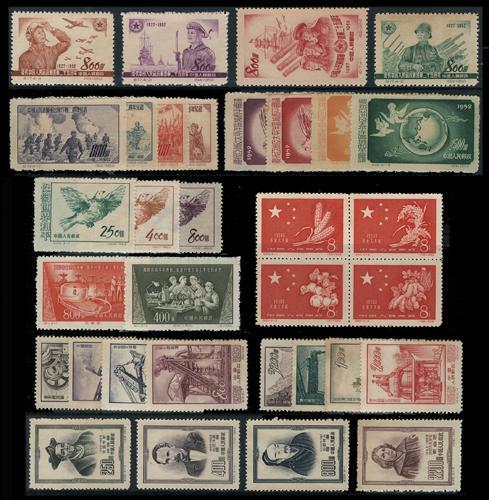 VF-F.
1940s-70s an accumulation of PRC mint or used stamps, holding on album pages, better including some nice CS, N & W series used or CTO stamps. Please view. 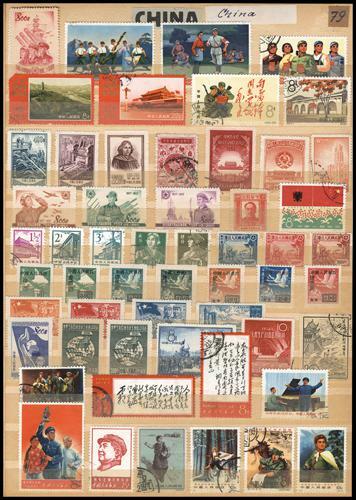 1940s-90s a group of 17 sets of JT mint stamps and 2 sets of Liberated Area issues, better including J7, J8, J10, J11, J12, J13, J23, J55 and others. Please view. 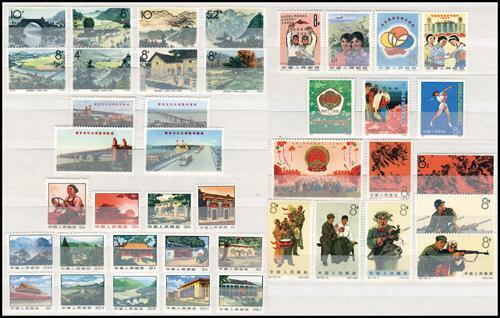 1950s a group of PRC Regular, Postage Due and Airmail issues, better including SC1, SC3, A1 & D1 sets. All unused except a few R1 used stamps. 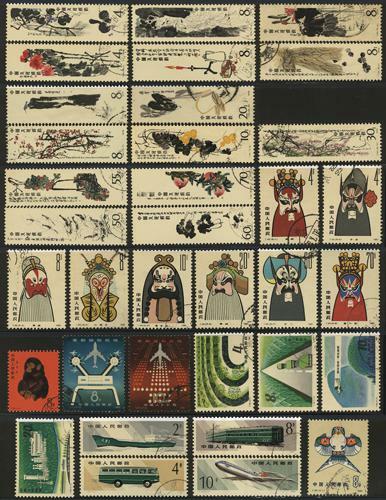 VF-F.
1950s a stamp book with 15 sets of C & S and Airmail issues, including many Original Print sets. Slightly toned. 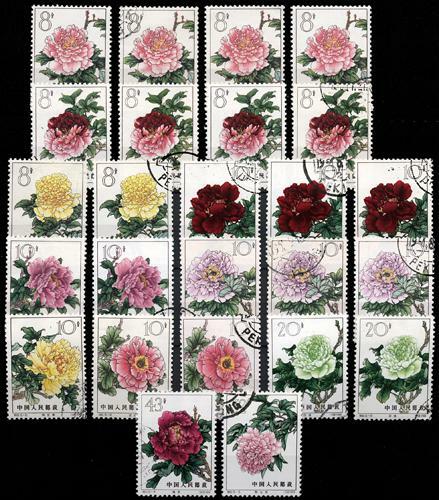 VF-F.
1950s-60s a group of 7 PRC stamps, mostly with minor varieties. An interesting group. 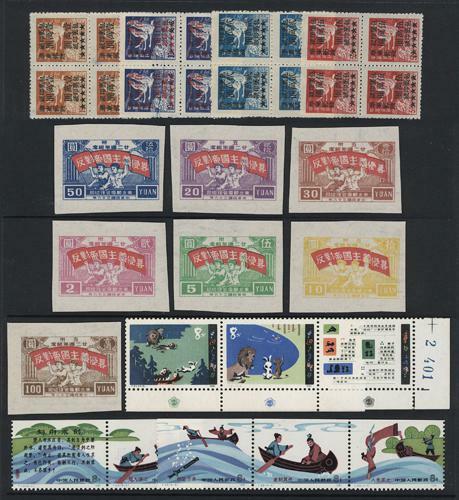 VF-F.
1950s-70s an accumulation of PRC CS, N, W & JT series issues, mostly in mint sets, plus some odd values and CTO/ used stamps. 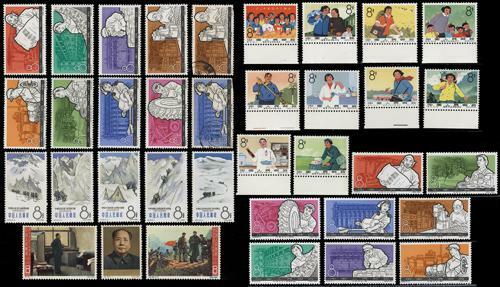 Better including C60 x 2 sets, S70 x 2 sets, S73 x 2 sets, T1 set and some nice odd value stamps. Please view. 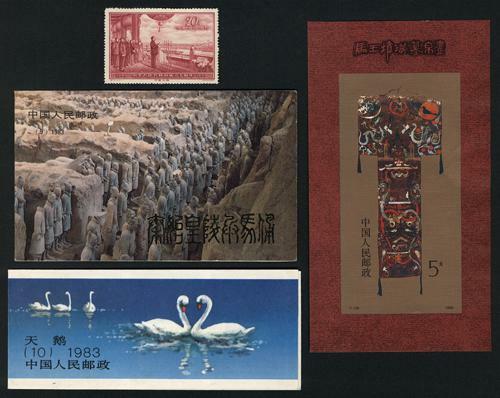 1950s-80s a collection of PRC CS & JT stamps, on album pages or stock cards, better including S46, J58, J59, T45, T53, T55, T56, T58, T60, T61, T64, T65, T67 and some others. Please view. 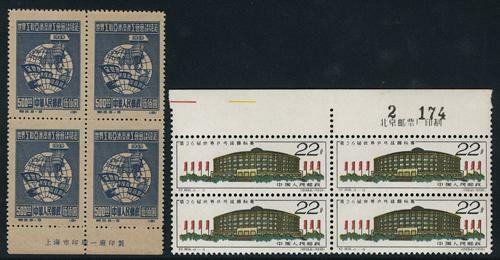 1950s-80s a small box of PRC mint or CTO stamps, mostly in complete sets. Better including C2 Original Print mint set, C106 mint set, C33M CTO set, T69 mint set, S68 CTO set and others. Please view. 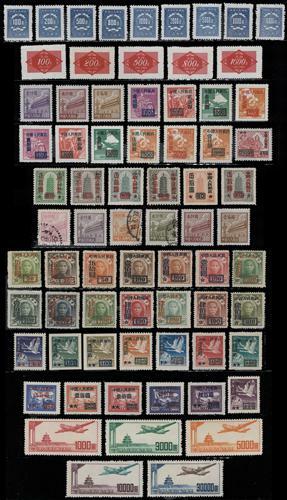 1950s-90s a collection of JT series used stamps and MS, totally 100++ sets, mostly postally used, a few CTO. Better including early JT sets and T46 Monkey. Large quantity. Need viewing. 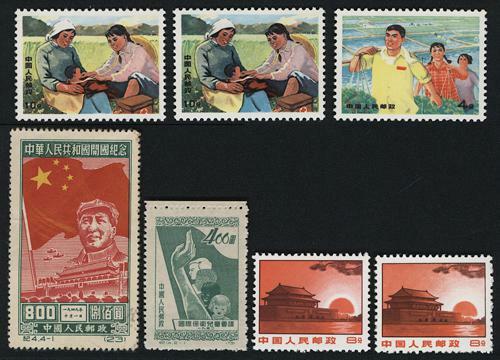 1950s-90s a carton of mainly PRC stamps and FDCs, strong in CS series issues, mint or used. Better including C69, C70, C109, S13 x 2, S15, S54 x 2, S69 x 2, S70 x 2 mint sets and many others. Please view. 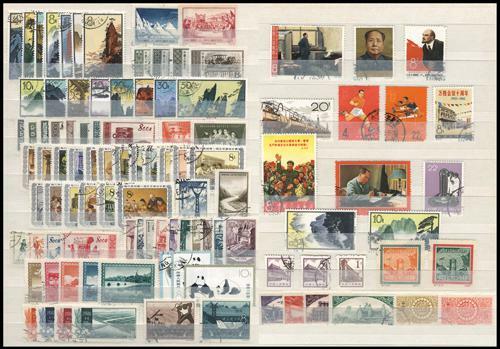 1950s-90s an accumulation of PRC mint or used stamps, MS and stamp booklet, holding on album pages, better including C97, S40, S51, S57 CTO sets, C94 22f-50f CTO, SB2, J63 & J71 sheetlets, etc. Please view. 1950s-90s C71, SB9, SB10 & T135M, all mint. 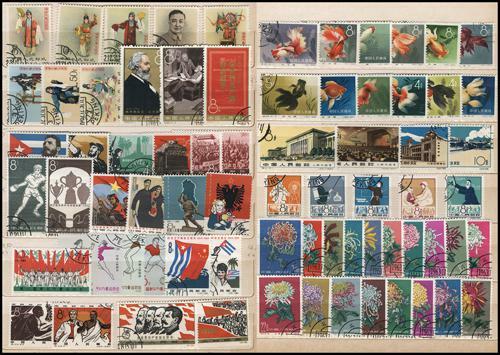 VF-F.
1951-66 a collection of almost complete CS stamps and few Regular Issues, holding in lighthouse album, mostly mint sets but a few CTO. Missing S38 Gold Fishes, S57 Yellow Mountain, C94 Meilangfang and a few others. Please view for more details. 1960s-70s a group of CS & W series used or CTO sets, comprising C33M CTO set, C121 used set, S74 CTO set, W1 CTO & used mixed set and W5 used set. 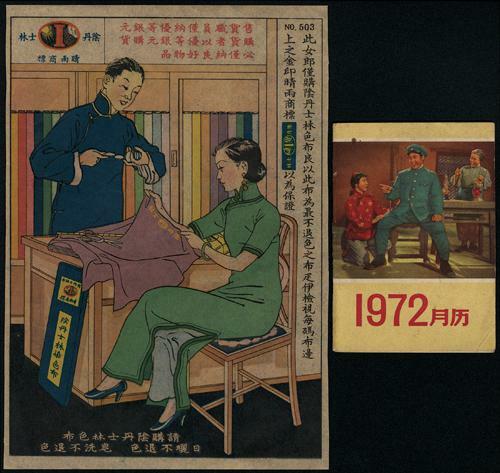 VF-F.
1970s-90s a box of mixed items, including 1990 Year sets, 1970s Cultural Revolution period Calander, posters, Hotel labes, etc. Please view. 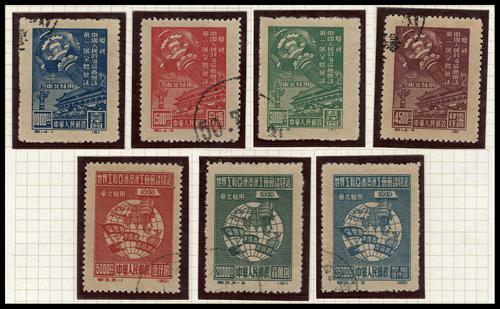 1940s-60s two albums of PRC C & S series issues, mint or used, mostly used or CTO but some early mint sets. Many duplicates. Large quantity. Plus several hundreds ROC issues. Need viewing. 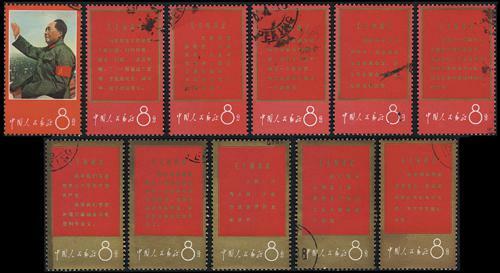 1949-50s a group of PRC C & S series Reprint stamps, including C1-C8 NE Use Reprint CTO sets and some C4 & C6 unused sets. 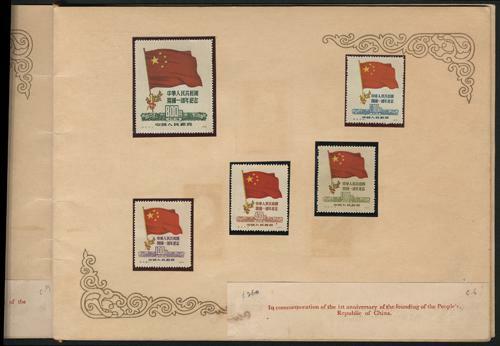 VF-F.
1949-60s a collection of PRC C & S series stamps set in an album, from C1 to C112 and S1 to S69, mostly complete. All CTO except C109 & C112 are mint sets. Some stuck on the album. 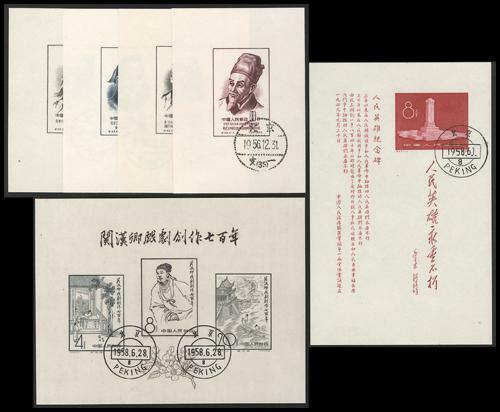 Generally VF-F.
1949-1962 a group of 5 complete sets of C & S issues in blocks of 4, mostly with imprint margins, including C3, C11, C86, C91 and S52. All mint, some with light toning. 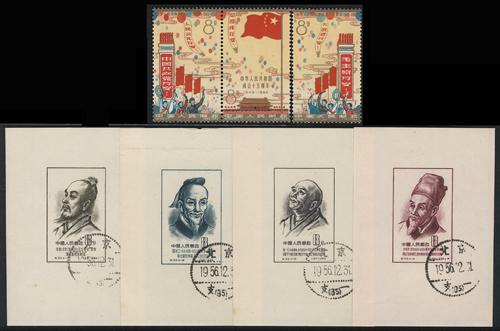 VF-F.
1950s a group of PRC old currency unused issues, holding on 8 stock cards, including Airmail issues, C & S series issues and Regular issues. Plus a few Liberated Area issues. Please view. 1950s C33M, C47M and C50M, all CTO, Very Fine. 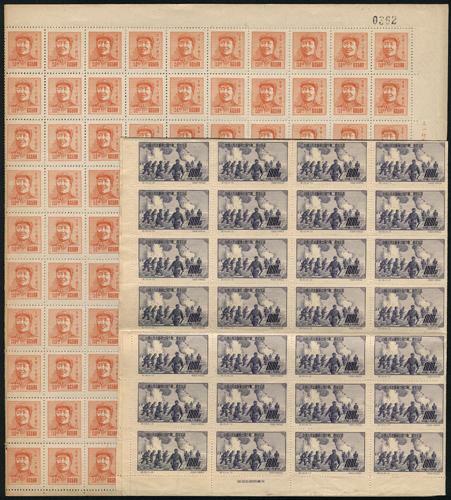 1950s a group of 21 sets of C & S series stamps, all old currency issues. Unused without gum as issued. Some with light toning. 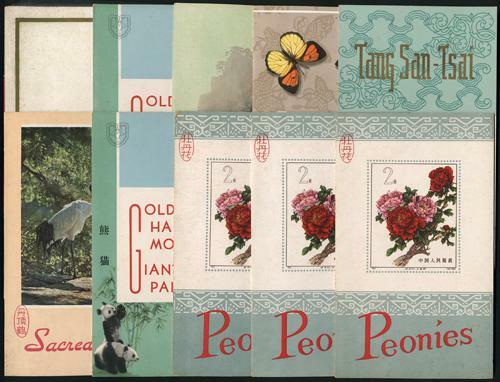 VF-F.
1950s-60s a group of 10 PRC CS series stamps folders, comprising S46, S48, S56, S57 & C67-70, S59+S60 x 2 and S61 x 3. 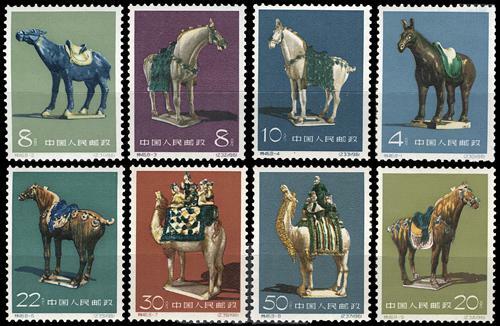 All with complete sets of CTO stamps inside. VF-F.